It is always interesting to look at a battle through the enemy’s eyes but rarely possible. After Buna we captured many diaries kept by individual Japanese soldiers. These diaries, when translated, were informative. From them we learned that the enemy feared our mortars most, our artillery next, and our aerial strafing and bombing least. During the early stages of the campaign the entries clearly reflect the official Japanese Army propaganda line that the American was not a formidable soldier. The enemy has received almost no training. Even though we fire a shot they present a large portion of their body and look around. Their movements are very slow. At this rate they cannot make a night attack. The enemy has been repulsed by our keen-eyed snipers. In the jungle it seems they fire at any sound, due to illusion. From sundown until about 10 P.M. they fire light machine guns and throw hand grenades recklessly. They hit coconuts that are fifteen meters from us. There are some low shots but most of them are high. They do not look out and determine their targets from the jungle. They are in the jungle firing as long as their ammunition lasts. Maybe they get more money for firing so many rounds. The enemy is using ammunition wildly. I wish the main force would hurry and come. The enemy has become considerably more accurate in firing. Enemy approached to about 50 meters. Difficult to distinguish their forms in the jungle. Can’t see their figures. The nature of the enemy is superior and they excel in firing techniques. Their tactics are to neutralize our positions with fire power, approach our positions under concentrated mortar fire. Furthermore, it seems that in firing they are using treetops. During daytime mess, if our smoke is discovered, we receive mortar fire. From today’s mortar fire the third platoon received great damage. Headquarters is a pitiful sight due to artillery fire. Carried in one coconut tree and filled in all of the shelter. Now we are safe from mortar fire. Artillery raking the area. We cannot hold out much longer. Our nerves are strained; there is a lack of sleep due to the continuous shelling. The enemy scouts which have been bothering us all night quit about two hours before dawn. The night strain has passed. Enemy scouts appear everywhere and attack, shooting automatic rifles. A second series of diary excerpts collected by my staff presents an even more interesting and unusual picture of the garrison troops. These paragraphs are highly personal and represent the aspirations, fears, and frustrations of men. They demolish the idea that the Japanese soldier, however rigorously trained, is “unemotional,” an automaton. Morale of troops is good because we feel reinforcements will come. Received word of praise from the Emperor today. We will hold out to the last. . . . Our troops do not come. Even though they do come, they are driven away by enemy planes. Every day my comrades die one by one and our provisions disappear. We are now in a delaying holding action. The amount of provisions is small and there is no chance of replenishing ammunition. But we have bullets of flesh. No matter what comes we are not afraid. If they come, let them come, even though there be a thousand. We will not be surprised. We have the aid of Heaven. We are the warriors of Yamamoto [sic; probably Yamato]. How I wish we could change to the offensive! Human beings must die once. It is only natural instinct to want to live; but only those with military spirit can cast that away. With the dawn, the enemy started shooting all over. All I can do is shed tears of resentment. Now we are waiting only for death. The news that reinforcements had come turned out to be a rumor. All day we stay in the bunkers. We are filled with vexation. Comrades, are you going to stand by and watch us die? Even the invincible Imperial Army is at a loss. Can’t anything be done? Please God. Night falls. Thought we saw two enemy scouts. It turned out to be a bird and a rat. It is certainly lamentable when everyone runs off and not a single person remains to take care of things. Can these be called soldiers of Japan? The question shows a profound ignorance of the situation as it existed in 1942. It is true that later in the war we successfully by-passed many Japanese garrisons, cut across their sea and land supply lines, and, in the words of the callous amateur strategist, left them “to starve and rot.” But that was at a time when we had secure bases from which such operations could be maintained, when we had achieved air superiority and were on the way to supremacy at sea as well. At this same time, it should be made clear, the Allies were also dealing with another Japanese offensive in the Pacific, the drive down the Solomons. This theater of action was under Navy command with headquarters in Noumea. The area was called “South Pacific” to differentiate it from “Southwest Pacific,” where General MacArthur was Allied chief. In the Solomons, operating on a shoestring and with heavy losses in fighting ships and planes, Americans were seeking to maintain a precarious foothold on the advanced beachhead at Guadalcanal. I still recall the dismal August day when Admiral Leary told me the results of the Battle of Savo Island. We had five heavy cruisers and a group of destroyers there to protect our Guadalcanal transports. The engagement lasted eight minutes. The Japanese had no losses. We lost four of our cruisers — the Quincy, Vincennes, Astoria, and Canberra (Royal Australian Navy). The fifth cruiser, the Chicago, was damaged. It took considerable optimism in those days to believe we were on the winning side of the fight. It was a poor man’s war in the Pacific, from the Allied point of view, when the Battle of Buna was fought. The miracles of production managed by American factories and American labor were slow to manifest themselves Down Under. We were at the end of the supply line. There were no landing craft for amphibious operations; indeed, because the Japanese had air control in New Guinea waters, no naval fighting ship of any size was permitted to enter the area. The Japanese had gone into the war fully prepared; in 1942 it was they who had the specially designed landing craft for amphibious campaigns, the equipment, the ships, the planes, and the battle experience. In battle the margin between victory and defeat is often narrow. Under the terrific pressures of combat, officers and men alike tend to forget that the enemy is hard pressed too. Sometimes just plain stubbornness wins the battle that awareness and wisdom might have lost. That’s what happened at Buna. The Japanese morale cracked before ours did. Major Schroeder was one of the brave, stubborn men. He was killed in the very attack that won us the sea. Organized resistance ended on January 3, but for many days thereafter our soldiers were hunting out Japanese stragglers in the jungle and swamps. Almost all resisted capture and had to be killed. In New Guinea the fighting into the autumn was largely an Aussie show. Our Air made it possible, our Amphibs did much of the fetch-and-carry, elements of our 162nd Infantry Regiment handled themselves gallantly, but the main responsibility was borne by the 7th and 9th Australian Divisions. Because of the term “Allied Forces,” which the censors then employed, many Americans still believe erroneously that our own troops carried the burden of that back-busting advance against the Salamaua-Lae-Finschhafen sector. The Aussie advance took off from the inland village of Wau, which is about one hundred and fifty miles northwest of Port Moresby. Around Wau, which is thirty-five hundred feet high, lies one of the richest alluvial gold regions in the world. More important militarily to the Australians was the small, steeply sloping Wau airfield. An interesting and little known chapter of history was written there. In the main, these island assaults ["52 D-Days" between Dec. 1944 and Aug. 1945] were made with small units of such divisions as the 24th, the 40th, the Americal. One of the colorful outfits which took part in the enterprise was the 1st Philippine Infantry. This was an American regiment made up of American Filipinos (most of them from California) who had volunteered to fight for the homeland. The regiment was organized as the result of a suggestion by the then President Quezon to President Roosevelt. I used the 1st Philippine Infantry also in the subjugation of Samar, and its record was excellent. As a matter of fact, by this time I had requested that General Irving be assigned to me as the boss of what we called Eighth Army Area Command. This meant that Fred Irving would command combat activities in Samar as well as supervise military areas behind us. Fred fell heir not only to the 1st Philippine Infantry but to an entirely separate outfit of American Filipinos known as the 1st Philippine Battalion. These troops had sound training. When GHQ requested Spanish-speaking American troops to serve as military police in Manila, Irving recruited them from the 1st Philippine Battalion. Ten amphibious landings were necessary to wipe out the Japanese positions astride the over-water route south of Luzon. Usually we sent Americans ashore for the quick capture of an island and then moved in native irregulars and guerrillas to serve as garrison troops. In this way we were able to use our combat veterans over and over again. Much of the credit for the speed and efficiency of the enterprise belongs to the motor torpedo squadrons of Seventh Fleet. By day and night raids, by constant surveillance, they disrupted interisland traffic and blocked evacuation of enemy units to Luzon. I was proud of the job the 41st Division had accomplished at Zambo when the fighting was done. They laid down their guns and went to work. They cut weeds and they cleaned out debris. They became good neighbors. The Japanese had refused to allow Catholic Filipinos — there were a good many in that Moslem area — to worship at the ancient shrine of Bien Bernido al Virgen del Pilar. The shrine was about the size of an American sandwich shop, and it was tucked into a space along a section of the Fort Pilar wall which had fallen into ruin. GIs of the 41st Signal Company (and I hope my good friend Cardinal Spellman will note this) went at the work of repair and finally put up a sign welcoming all nationalities to worship there again. Before long there were hundreds of burning candles, and the glory of Pilar’s ancient shrine was restored. Methodists, Episcopalians, Congregationalists, Presbyterians, and lads of no faith at all took part in that enterprise. I left General MacArthur at Zamboanga. I knew now what the future held. I would take over-all command of the Philippines on July 1. Sixth Army staff would be retired to plan an invasion of the southern islands of Japan. According to GHQ plan, Sixth Army would invade Kyushu — and hold. General MacArthur told me that Eighth Army later would make the main blow along with reinforcements which were still to come from the States or the European theater. Eighth Army, with most of the armored and paratroop divisions, was to land and to proceed across the Kanto Plain to capture Yokohama and Tokyo. General MacArthur’s choice of Eighth Army to make the strike was a great compliment to my men, but I knew the Kanto Plain — and what a gamble lay ahead. [General] Doe’s lads of the 41st Division had dug out most of the Japanese on the island of Jolo, and I had promised to pay a formal call on Muhammed Janail Abiri[n] II, Sultan of Jolo and spiritual leader of the three hundred thousand Mohammedans in the Sulu Archipelago. This meant a round trip of approximately a thousand miles in one day, so we departed from Tacloban early. Weather was perfect. The airstrip at Jolo was no La Guardia Field, but, after circling it several times. Downer brought us in without incident. When we returned four and a half hours later, however, the wheels had sunk so far in the soft ground that it was necessary for a pair of tractors to pull the Miss Em out on the runway. Colonel Moroney, thin and hard-bitten commander of the 163rd Infantry, veteran of Sanananda and Biak and other battles, met us, while his soldiers kept back the great crowd of Moro spectators who wanted to surge across the airstrip. First we drove through Jolo City, an ancient and once beautiful town which had been known as the “Jewel of the Sulus,” and as the “Shrine City of the Moros.” It was in ruins. The Japanese had put it to the torch when American PT boats attacked shipping in the harbor as a preliminary to invasion. Then we started our drive inland. This was a country of great beauty, of teak and mahogany forests and dark low mountains. I knew the patriarchal Sultan (who had surrendered to Captain Pershing in 1913 at the end of the Moro War) had remained loyal to the United States during the Japanese occupation and had surreptitiously flown the Stars and Stripes at his hideout camp. When Moroney’s men came ashore he brought out the tattered old flag. The Sultan of Jolo — sometimes called the Sultan of Sulu — had once been a wealthy man. The Japanese had stripped him (he told me) of most of his possessions; he keenly felt the loss of a saber presented to him by General Pershing and a rifle presented to him by General Leonard Wood. I was somewhat surprised by the simplicity of his living. Around his compound there was a fine bamboo fence thickly woven to keep out Jap infiltrators. Inside the compound there was a sunken fort where the women could stay in safety while the men manned the barricades. The Sultan's unpretentious house stood on a raised bamboo platform well off the ground. The Sultan was a gaunt, dignified old man with sunken cheeks. The room where we were received by the Sultan and his datus (leaders) seemed to be tapestried on ceilings and walls; I believe now that the tapestries actually were Persian rugs. After some diplomatic talk through interpreters, I presented him with the most modern type of American carbine and a scroll thanking him for his services to the American cause. In his presence I affixed a gold seal with ribbon to the document. I also presented him with a handsome roll of cloth as a tribute to the ladies of his household. The ladies did not appear, but during the visit we glimpsed them peeping out at us from doorways. I was told that the Sultan had eight wives and was, at seventy-two years of age, the recent father of a twenty-sixth son. The headquarters of the 38th Division, which had been assigned the job of cleaning up central Luzon, was on a ridge only about an hour’s ride east of Manila. Major General William G. Chase, division commander, met me at Nielson Field, and we made the inspection trip to the front together. From a high hill. Chase and General Bill Spence pointed out to me the Ipo Dam area and other battlefields of the 38th; although the tempo of the fighting was now slowed, two hundred and fifty-nine Japanese were killed between dawn and dusk the day I visited there, and twenty-nine were captured. The 38th and elements of the 43rd Division inflicted appalling losses on the enemy during a six-week period. Some sixty-three hundred Japanese were killed or found dead and more than nine hundred were made prisoners. Much of this slaughter was accomplished by combined artillery fire and aerial attack. Losses of the 38th Division and 43rd Division were small. That evening at Chase’s headquarters I wrote General MacArthur that I had inspected the combat-active divisions on Luzon and found morale very high. My own morale was high. I was convinced that the back of Japanese opposition was broken and that the enemy was incapable of effective resistance. I might not have been so optimistic if I had known that, considerably after the official Japanese capitulation. General Yamashita was to come out of the mountain wildernesses to the northeast of Baguio and surrender forty thousand well-disciplined troops. Although negotiations with Yamashita for surrender were completed after Eighth Army had relinquished control of Luzon, the story should be told here. It must be remembered that Japanese forces at this period had little or no communication with the homeland. On August 7 — the day of the fall of the first atomic bomb — an American pilot was forced to abandon his disabled plane and parachute behind the Japanese lines in northern Luzon. He was picked up by an enemy patrol the next morning and taken after five days of forced marches to General Yamashita’s headquarters, then southwest of Kiangan. There he was subjected to vigorous and prolonged interrogation. He was threatened with physical violence when he steadfastly refused to answer questions. On August 16 — the Emperor first offered to capitulate on August 10 — the attitude of the Japanese interrogators abruptly changed. The pilot received medical treatment for his parachute-jump injuries and was extended many small courtesies. The next day the American was guided toward the American lines; when the Japanese soldiers had gone as far as they dared, they gave the flier a letter, written by Yamashita himself, which explained the circumstances of the pilot’s capture and commended him for his military spirit and devotion to duty. 1. I have the honor to acknowledge receipt of your communication addressed to me, dropped by your airplane on August 24th as well as your papers dropped on August 25th in response to our ground signals. Tomoyuki Yamashita, General, Imperial Japanese Army, Highest Commander of the Imperial Japanese Army in the Philippines. This message was the first of a series exchanged between Yamashita and General Gill. The exquisite courtesy of the exchanges probably has for the average reader something of the quality of Through the Looking-Glass; these same troops and same commanders had been fighting each other in the same area with no quarter whatever and in a completely barbaric manner. Eventually an American radio group, escorted by a Japanese safe-conduct party, moved into Yamashita’s headquarters to take over communications. Details of the surrender were worked out. On the morning of September 2 General Yamashita and a party of twenty-one, which included Vice Admiral Okochi (“Highest Commander of the Japanese Naval Forces in the Philippines”), entered American lines at Kiangan. The party was escorted to Baguio where the formal instrument of the surrender of all Japanese Army and Navy personnel in the Philippines was signed in my former headquarters. I was sorry that General Griswold who had directed XIV Corps operations could not be there to accept Yamashita’s sword. But it was entirely fitting that the 32nd Division should receive the vanquished enemy. Three years before at Buna they had won the battle that started the infantry on the jungle road to Tokyo. General Yamashita was tried for “crimes against humanity” by an American Military Court in Manila. He was sentenced December 7, 1945, and hanged on February 23, 1946. We encountered a few interesting placename etymologies on our recent travels in Japan. 五毛 Gomou ‘Five Hairs’ < 胡麻生 Gomau ‘Sesame Growth’ - I spent my high school years in a dormitory atop Nagamine-dai (‘longridge-heights’) below towering Maya-san in Nada-ku (‘opensea-ward’), Kobe. The neighborhood at the base of our hillside was called Gomou, written as if it meant ‘Five Hairs’ (五毛). I never paid attention to how it got its odd name until I went back by there on this trip. According to its short Wikipedia article, the name Gomou originated as Gomau (胡麻生 ‘sesame-grow’) because the area was not suitable for paddy fields, so the farmers grew sesame instead. (The city in Gunma Prefecture called Kiryu—桐生 < kiri-u ‘Paulownia-grow’—must have got its name for similar reasons.) Over time, the pronunciation of Gomau changed to Gomou, the sesame fields disappeared under dense urban growth, and someone devised entirely new kanji, with no etymological continuity at all, to match its new pronunciation. 神居木 Kamoigi ‘god-dwell-tree’ - While walking a woodsy stretch of the old Nakasendō (中山道 ‘Central Mountain Route’) between Magomejuku in Gifu-ken and Tsumagojuku in Nagano-ken, we came across signage about some old, famous sawara cypress trees, one of which had acquired the name 神居木 Kamoigi ‘god-dwell-tree’ because a god supposedly rested in it long ago. I wonder where the -o- came from. The morpheme written 木 ‘tree’ is pronounced -ki in Tochinoki ‘horsechestnut-POSS-tree’ but -gi in the prefecture name Tochigi ‘horsechestnut-tree’. In native Japanese placenames, the kanji 神 ‘god’ is most often pronounced either kami- as in Kamiyama 神山 ‘god-mountain’ or kan- as in Kanda 神田 ‘god-paddy’, but it is also pronounced kō- in Kōbe 神戸 ‘god-door’. The kanji 上 ‘upper’, which appears in many placenames old and new, shows similar variation, ranging from 上山 Kamiyama ‘upper-mountain’ to the ancient province names 上総 Kazusa (now Chiba Prefecture) and 上野 Kōzuke (originally 上毛野, now Gunma Prefecture). In such cases, the long -ō- replaces the earlier -am- or -an-; it does not follow after kam- or kan-. So I suspect the -o- somehow comes from the 居 i(ru) ‘reside, dwell’ (as in 居酒屋 izakaya lit. ‘dwell-sake-shop’), which is pronounced o(ru) in several regional dialects of central and southwestern Honshu. In fact, I wonder if the earlier name for the tree might have been pronounced Kami-o(ru)-gi ‘god-dwell-tree’. The city of Hue fell again and for good in March 1975, and Saigon followed a month later, as US helicopters scrambled to evacuate remaining American personnel and as many South Vietnamese officials as they could carry. The final images of desperate civilians clinging to the skids of American choppers as they lifted off framed the futility of the decade-long effort. Nevertheless, in the nearly half century since, some American military historians and many American veterans have insisted that the Battle of Hue was won, and that, indeed, the entire Tet Offensive was an unqualified American victory. Westy certainly felt that way. Eight years later, in his autobiography A Soldier Reports, he was still insisting that he had not been surprised by the Tet attacks—he said he had forecast the attacks on the city but that word apparently did not reach the MACV compound in Hue. He conceded at long last that on the morning of January 31, 1968, “the MACV advisory compound was under siege and most of Hue was in enemy hands, including much of the Citadel.” Yet the battle to win back the city warranted only two pages in his 566-page book. He portrayed it in perfunctory terms, complimenting the American and South Vietnamese commanders on their excellent leadership, exaggerating enemy deaths, and underreporting the number of Americans killed by nearly a third. He lamented the destruction of the historic city, and effectively lay blame for all civilian losses on Hanoi, citing only those killed in the purges. He makes no mention of civilians killed by American and South Vietnamese bombing and shelling. If your knowledge of the Battle of Hue came from Westy alone—from his public statements at the time and from his memoir—you would view it as a thumping American victory. This was certainly not the experience of those who fought them in Hue. To a man, the American veterans I interviewed told me they had faced a disciplined, highly motivated, skilled, and determined enemy. To characterize them otherwise is to diminish the accomplishment of those who drove them out of Hue. But taking the city back qualifies as a “victory” only in a narrow sense—they achieved their objective. In any larger sense the word hardly applies. Both sides badly miscalculated. Hanoi counted on a popular uprising that didn’t come, while Washington and Saigon, blindsided, refused to believe the truth. Both sides played their roles courageously, and to terrible effect. In sum: Hanoi’s troops seized the city and were then forced at tremendous cost to relinquish it, while the city itself was leveled in the process. The status quo was upheld but greatly diminished, and it lasted for only a few more years. How is this victory? It takes a determined act of imagination for either side to make that claim. It makes more sense to consider the ways both sides lost. If we use Westy’s favorite measure, the body count, the battle’s clearest losers were the citizens of Hue. In the city today, where memories of that nightmarish month are still bitter, it is said that there is a victim under every square meter of ground. It remains a shameful fact in the Socialist Republic of Vietnam that many hundreds, perhaps thousands, of its citizens were dispatched deliberately by their “liberators.” The ruling Communist Party labors to promote national unity by remembering the conflict not as a civil war but strictly as a struggle for independence, so reprisals against its own countrymen are an inconvenient memory. The party has never named or punished those responsible, not least because they were following clear orders from above. Many of those who carried out the purges have been celebrated as heroes of the state. The official position is that while there were some excesses, some “mistakes,” the numbers have been exaggerated by Vietnam’s enemies. Of those who perished, by far the greatest number were killed by accident, either in the cross fire or by allied shelling and bombing. Accidental deaths do not equate morally to mass execution but, as the writer Tran Thi Thu Van has pointed out, the effect is the same. Today we rightly weigh the cost in civilian lives whenever violent action is taken, but I found very little concern expressed in 1968, not in any of the official papers I reviewed, not in contemporary press accounts or the dozens of books and papers written since, and not, for that matter, in any of the interviews I conducted. Vietnamese civilians, when they do come up, are described as a nuisance, even though the battle, like the war, was ostensibly about them. Nearly every marine I interviewed recalled seeing dead civilians in the streets, inside buildings, and in bunkers underneath those buildings. The Citadel, in particular, was a confined area, where escape was all but impossible. Nearly all the civilians I interviewed who survived the battle described losing family members, most often to shells and bombs. The survivors described, without hesitation, bombardment as the most terrifying memory, even those who’d had family members executed. If Hanoi did not win many new friends by taking Hue, neither did the allies in taking it back. Still, there is no question that the Vietnamese people lost something precious when Hanoi won the war. One young woman from Ho Chi Minh City, born decades after the war ended, told me that her generation looks at Seoul and at Tokyo and asks, “Is this what we would have been if we hadn’t chased the Americans away?” And while the Communist Party has relaxed its hold on the economy, to great effect, Vietnam remains a strictly authoritarian state, where speaking your mind, or even recounting truthful stories from your own experience, can get you in trouble. Researching the Battle of Hue was tricky. In telling the story I was revisiting a heroic chapter in the national struggle, but I was also reopening old wounds. The purges in 1968 left many citizens with profound grievances against the state that they remain frightened to voice. Many were reluctant to speak candidly to me, particularly those with sad stories. On my first visit I worked with an independent translator and guide, Dang Hoa Ho, a former Vietnamese military officer (he is too young to have fought in the American War and served in Vietnam’s modern army), who was skilled at putting people at ease and who fully understood my desire for uncensored memories. On my second trip, against my expressed wishes, Hoa was nudged aside by Dinh Hoang Linh, deputy director of Hanoi’s Foreign Press Center, part of the country’s Ministry of Foreign Affairs. Linh proved to be unfailingly helpful and charming, and a skilled translator, but his presence had a chilling effect. Che spoke no English, but she had been warned that when she heard the Americans shout “VeeCee,” it meant they needed to move fast, they had been spotted. She exchanged fire with the marines but never took careful aim. There were too many of them coming. When she used the rifle, she would just spray fire in the general direction of the enemy. After one skirmish she recovered a newer, more lightweight American rifle, an AR-15, which she preferred. Teams of the young people brought her ammo for it, looted from ARVN depots. Whenever Lien fired her B-40 they would immediately run to a different trench, because it gave away their location and drew a hail of return fire. It took seven seconds for the launched grenade to explode. For some kinds of grenades it was only three seconds. For days they shot and ran, shot and ran. They moved so fast they rarely had a chance to see if they hit anything. At the nearby Cong Market, her friend Hoang Thi No was engaged in a similar running street fight. She found the marines easy targets, because they were big and because they did not move confidently in the streets the way she and her team members could. She was very familiar with the blocks where she fought, so she knew which way to run when the shooting came close. To her, the Americans with all their heavy equipment were like men who had fallen from the sky to a strange planet. She picked them off individually, and when she found them in a group, she and her comrades threw grenades. The carnage she saw around her did not so much frighten as enrage her. Hoang resolved to fight to the death. She expected she would be wounded or killed because so many others had been. She didn’t think about it. She just fought. She was seventeen and excited and filled with pride and she did not tire easily. At night she and the others in her squad took turns sleeping for an hour or two. Four of those in her group were killed before they were finally ordered to withdraw to the forest and regroup. Hoang’s team lasted longer than Che’s, which was in the path of Lieutenant Smith’s company. It held its own until the air and artillery bombardments started, which were unlike anything the girls had ever experienced. Men learned firsthand how to gauge the severity and type of wounds. Shrapnel burned. It was hot metal. If you were hit by shrapnel it felt like someone touching you with fire. With a bullet the first thing you felt, after the shocking impact but before the pain, was wetness. Shrapnel cauterized the wound instantly, but bullets made you bleed. You tried not to think too hard about it. Thinking about it was tempting fate. And fear? Fear was just the air you breathed. Most kept going. The sun would rise and they would form up and wait to be told to run across another street, climb through another wall, barge through another door, knowing each time it might be their turn to pay the price. Art Marcotte, a private from Boston, would feel sick to his stomach with fear when he was ordered to step out into a street or run across a courtyard under fire. But he went. Hygiene was a memory. Since many had been plucked from the field and sent directly to Hue, they had not washed in weeks. At night they shared a toothbrush. All of the men gave off a pungent odor. One of Connelly’s jobs as corpsman was to find a safe spot to dig a latrine, a trench. He would find a chair and knock the seat out of it to serve as a commode. One day in his second week Fox Company passed through a wastewater treatment facility near the canal. It had large circular vats made of concrete divided into reeking pie-shaped segments where human waste settled out before the water was drained off for the next step in its purification. A rocket blast knocked three marines into one of them, and because they were loaded with gear, there was a danger they might drown. Connelly and another corpsman had to plunge in to pull them out. They hadn’t thought it possible for men to smell worse, but after that, they did. NHAN DAN, THE people, had nowhere to go. Far from being liberated by the invading Communist army, they had been trapped by the Tet Offensive in a nightmare of bloodletting. For some it began on the first day, but as the battle entered its second week, it encompassed all. At first there were enough eager converts to swell the sails of the true believers. The young commissars proclaimed the war all but won. Citizens were rising up not just in Hue, they said, but throughout South Vietnam. Independence and reunification were at hand! For Xuan, the poet propagandist, these first days were like a dream. Small red flags came out and flew from dwellings up and down the crowded streets. Even some of his old friends who had shown no enthusiasm for the revolution were now active recruits. At his political headquarters in the post office inside the Citadel, there were three lines of people waiting to sign confessions about their past sins and to enlist in the righteous cause. Some told him they had been inspired by his rhetoric, that he had spoken to their hearts. Nguyen Van Quang, the local organizer who had smuggled arms into the city and then led troops through Chanh Tay Gate, moved in with a local family. They prepared celebratory feasts with food they had collected for the holidays and shared freely. It felt right that the revolution in the city’s streets was being led by Hue’s own youth. After all, in China the zealous young Red Guards were upending their own society with Mao Zedong’s “Little Red Book.” All over the world in 1968, like some global fever, young people were challenging authority and demanding change. While in the United States and Europe “revolution” was an excuse to sell pop music, stage protests, and hold festivals, it was being played for keeps in Asia. Young people were not just challenging their elders but pushing them aside, expelling, imprisoning, and in many cases executing them, all the while extolling the young as the righteous vanguard, their very youth a badge of purity. They were, by definition, forward-thinking. And in Hue they were armed. In stories and songs and lectures the commissars celebrated the people as the wellspring of all power and virtue, but there was, nevertheless, need for instruction and guidance. Some things would have to change. Decadent Western influences were everywhere, and not just in politics. The modish hairstyles and short skirts favored by the more fashionable girls, for instance . . . these were unseemly and un-Vietnamese, as were wealth and corrupting ideas. With an army behind them, the commissars were hastily remaking Hue in their own image. The first priority was the city’s defense, and for this everyone able was put to work. Then there was the business of correcting errant thinking. For this there were public lectures on the seven tasks of all party members and on the slogans of Uncle Ho, which were to be memorized and shouted in unison. The Front had issued stern prohibitions on looting, but the commissars and their local militias had a different understanding. They saw strong revolutionary logic in confiscating whatever was needed—food, shelter, supplies . . . or those things that caught their eye. They took cars, scooters, and bicycles. Boys and girls in Hue were amused by the young rebels trying to ride them. There was prudent acceptance of this plunder. [Viet Cong Lt. Hoang] called his strategy for resisting the coming counterattack bam vao that-lung dich (“hold on to the enemy’s belt”). It was how he hoped to overcome the Americans’ overwhelming firepower. The marines would typically hammer an enemy line with bombs and shells before advancing. By “clinging to their belt,” Hoang meant keeping his men so close to marine lines that it would be too risky for them to shell—he did not believe reports that Americans would not use heavy weapons in the city. His battalion was arrayed in two flexible and irregular defensive lines, one directly across the street from the marines and another two blocks back. During an attack the front line could bend in one place and hold in another. It would hold off an assault for as long as possible, and then fall back to the second line. If the attacking marines failed to occupy and hold the block they had just taken, as had mostly been the case so far, Hoang’s men would move back up at night, always staying directly across the street. If things worked out as he planned, this would force the marines to advance with small arms alone, evening the fight. In that kind of fight, Hoang believed his men had the advantage. Most were veterans with far more experience than the marines, and so long as their lines of supply stayed open they could resist for days, maybe even weeks, bleeding the marines for every square foot. By necessity, military commanders are realists, and to Hoang it was already apparent that the “general uprising” part of the Tet plan was not happening. While some had rallied to the cause, and others seemed willing to follow orders to help dig and carry and cook (keeping their true feelings to themselves), there had been no swell of popular support. The citizens of Hue had either fled or dug in. What he saw were people in shock over the violent disruption of their lives. Refugees ran to the countryside, if they could get there, or huddled in places they hoped would be safe: in churches, behind his defensive lines, or behind the American ones at the compound and now the university. They were not rallying to one side or the other; they were trying to stay alive. They hung close to the front lines for the same reason that he stayed close to the marines, to escape bombardment. So Hoang had no illusions about keeping Hue permanently. But he was going to make the Americans pay to take it back. During this year’s summer visit to Japan, the Outliers once again encountered a few remarkable new words of interest. アメポテ Amepote ‘American potato’ - On the shelf of a conbini (convenience store) we encountered a new acronym created from the initial two syllables of a longer pair of words. 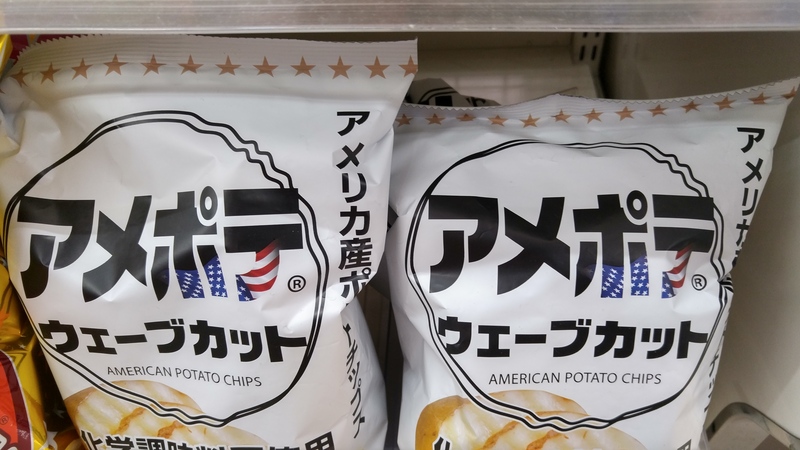 The katakana label on a package of “American Potato Chips” reads Amepote ueebukatto (‘Amer. Pota. wave-cut’), comparable to Amefuto for ‘American football’. This is a very common pattern of abbreviation in Japanese, one we also encountered in a Japanese TV biography about Amekei (雨敬 < Amemiya Keijiro 雨宮敬二郎), a Meiji-era businessman who first persuaded the Japanese government to build the Chūō (中央 Central) railway line into his native Yamanashi Province to enable farmers to get their produce out to the coastal markets. 出没 shutsubotsu ‘haunt, infest, frequent’ - We were not surprised to find signs warning of bears while hiking in the forests of rural Togakushi in Nagano Prefecture, but I was quite surprised to see this sign right next to the Japan Baptist Hospital in Kyoto, warning of bears in the very mountains I used to climb during my childhood there (at the foot of Mt. Hiei). 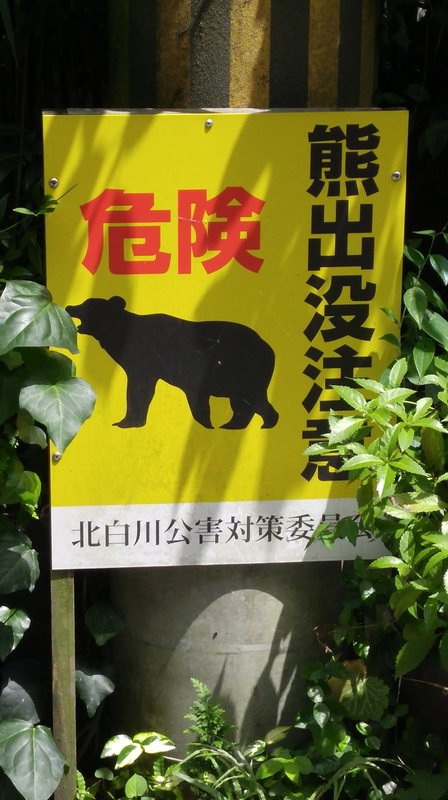 The sign reads 危険 熊出没注意 Kiken: Kuma shutsubotsu chuui ‘Danger: Bear infestation alert’. Such signs are very common along Japanese mountain trails these days. When we hiked a very well-traveled section of the old Nakasendō (中山道 ‘Central Mountain Route’) we saw many such bear warnings near small brass bells that travelers were encouraged to ring to scare the bears away. 蒜泥生肠 “Pork wombs marinated with hot soysauce”! - In a Chubu Airport (Nagoya) restaurant specializing in Taiwanese food, we encountered a menu item that even this experimental gastronome shied away from. It appears to be a dish unique to Singapore and Taiwan. 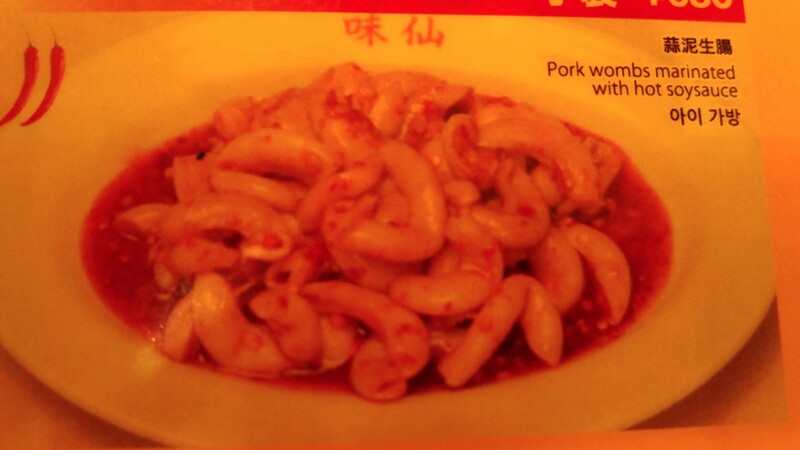 The Chinese menu item is 蒜泥生肠 suànní shēngcháng ‘garlic-mash birth-intestine (= birth canal/fallopian tube)’. (The kanji 蒜 or 大蒜 can be used to write ninniku ‘garlic’ in Japanese.) I couldn’t find shēngcháng 生肠 in my DeFrancis (1996) ABC Chinese-English Dictionary, and whoever translated it into Japanese and Korean seems not to have known the anatomical term for ‘uterus’ (neither did I), which is 子宮 ‘child-shrine = womb’ (Ch. zǐgōng, Ko. jagung, Jp. shikyuu). So the Japanese menu label for the dish is 子袋 ko fukuro ‘child bag’ and the Korean menu label is ai kabang ‘child bag’. I don’t know how the English translator came up with “marinated in hot soysauce” except by looking at the photo.